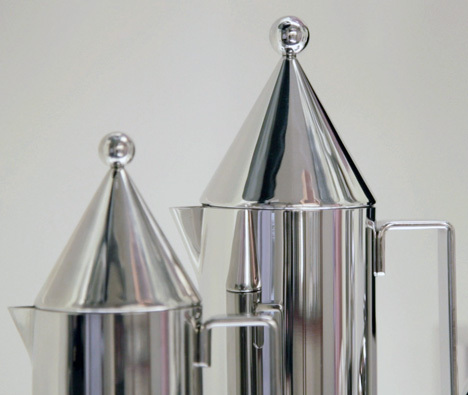 Movie: next up in our series of exclusive video interviews with Alberto Alessi, the Alessi president says that Aldo Rossi's La Conica espresso maker defies the key principle of 20th century design that form should follow function. "[Aldo Rossi's] practice was completely different from the usual practice of industrial design as it is taught in schools," Alessi says. "In schools they teach students that form follows function, but Aldo didn't believe that." The first product that Italian architect Rossi designed for Alessi was La Conica, a polished stainless-steel espresso maker with a cylindrical body and cone-shaped lid. "I consider this [to be] one of our most poetical products," Alessi says. "The emotion and the expression of the art is much more important than the function." Alessi says that he will try to work with designers to ensure that their products for Alessi are functional as well as beautiful, but is not always successful. "You don't need Alessi to have a well-functioning coffee maker – but we try," he says. "Sometimes a designer comes to us with a strong idea with some problems in terms of function. We try to modify, to convince the designer [to change the design] and sometimes we succeed and sometimes we do not." In the case of Rossi, Alessi says that he convinced him to design a cheaper, more practical espresso maker to sell alongside the much more expensive La Conica. "He designed a second coffee maker, [which was] much more functional called La Cupola," he explains. "Being in cast aluminium it is four-times less expensive [than La Conica], so it sells much better." This is one of a series of five movies with Alberto Alessi, in which he discusses some of the Italian brand's most iconic products. Look out for our movie about Michael Grave's kettle with a bird-shaped whistle tomorrow.